Park seniors Celka Rice and Branch Seidenman have received the highest national honors presented by the Scholastic Art & Writing Awards this year. Celka was awarded a National Gold Medal, signifying one of the most outstanding works in the nation, for her documentary photograph focusing on concepts of loss and intimacy. In celebration, Celka has been invited to attend the National Awards ceremony at Carnegie Hall in New York City this June, and her work will be exhibited at a gallery in New York featuring Scholastic Gold Medal winners. After the viewing in New York, the Gold Medal show tours colleges and galleries across the country. In February, Celka won six awards at the regional level for photography: two Gold Key works, two Silver Key works, an Honorable Mention work, and an Honorable Mention portfolio. 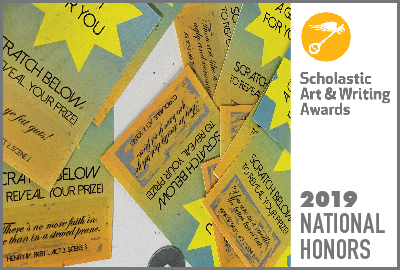 Branch was awarded a Silver Medal, demonstrating high honors on the national level, for his innovative Shakespearean Scratch-Offs submitted to Scholastic’s Future New category. A relatively new category, Future New asks students to produce work that challenges the boundaries of the Scholastic Awards’ current categories — work on the “cutting edge of creative practice,” according to Scholastic. “Work submitted should address the issues and concerns of our time through conceptual, social, or political content…work must be thought-provoking and reflect creative excellence.” Branch created the scratch-offs in his Senior Studio class this past year. When scratched, the lottery ticket-sized cards reveal a Shakespearean insult. “He’s known for pretty great insults,” says Branch. Presented by the Alliance for young Artists & Writers, the Scholastic Art & Writing Awards is the longest-running, most prestigious recognition program in the country for creative teens. Since 1923, the Awards have recognized the vision and ingenuity of our nation's youth. Students across the country submitted 340,000 works of art and writing to the Scholastic Awards last year. Panelists consider works that best exemplify originality, technical skill, and the emergence of a personal voice or vision. Congratulations to Branch and Celka and their families, teachers, and advisors! Photo: A collection of Branch's Shakespearean Scratch-Offs on display in Park's current gallery show.